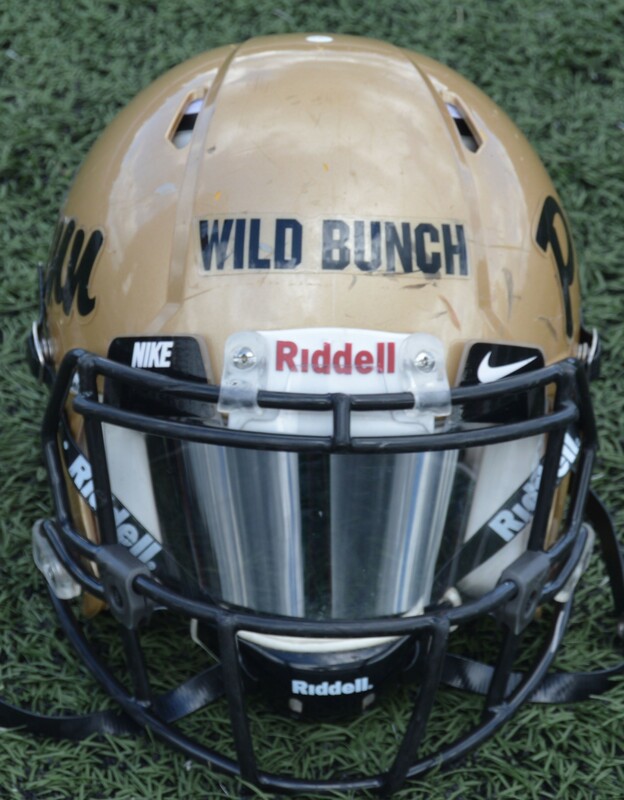 In the 1980’s Coach Chris Geesman introduced the Wild Bunch and Gold Rush stickers to the Penn Kingsmen. 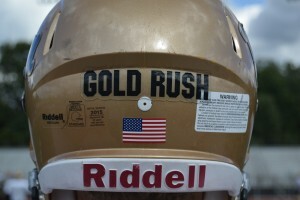 The Gold Rush stickers are for the offensive starters and the Wild Bunch stickers are for the defensive starters. Earning a sticker is a remarkable honor. Coach Geesman is one of the best coaches in Indiana ever, leading Penn to five state championships. In 2002, when Coach Geesman retired, Cory Yeoman, became the Penn Kingsmen head coach, and the Kingsmen have continued to respect and honor the winning tradition and the Wild Bunch and Gold Rush stickers. Coach Yeoman always stresses on how important the little details are to everything you do, and that is what it takes to earn one of the stickers. Earning the Gold Rush sticker takes speed, smarts and a sense of urgency to want to drive down the field and score every possession. 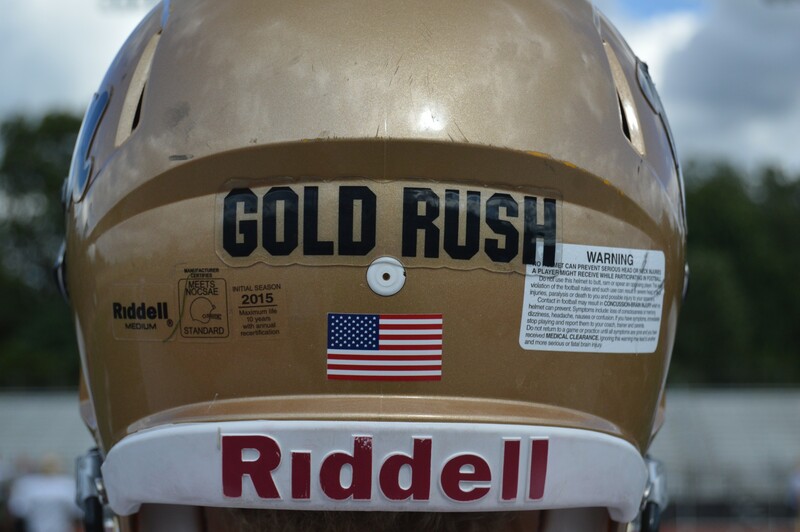 “The Gold Rush sticker is placed on the back of your helmets so that the defense can get up and turn around and read on the back of your helmet, read that Gold Rush sticker and say “what just hit me?!”. Make them remember what just hit them.” – Coach Trent Yeoman Offensive Coordinator. 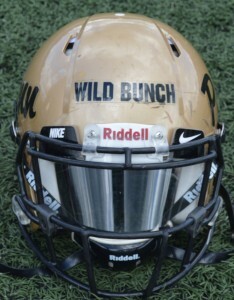 Earning the Wild Bunch sticker takes aggression, an urge to make the tackle every play, and smarts. “These Wild Bunch stickers go out to eleven crazy warriors, flyin’ around, makin’ plays, wanting to hit somebody every single play! Showing no mercy to your opponent. After you make a big play you get up and celebrate with your teammates with a little zest.” – Coach Patrick Barrier Inside Linebacker Coach. Head Coach Cory Yeoman always uses the motto, “Smart, fast, and physical”. It takes those three things to become a great player. Being able to earn a Wild Bunch or Gold Rush sticker is one of the highest honors in the Penn program. Penn players wear the sticker with pride, dignity and honor. They are able to fight for your buddy next to you, and there is nothing better than that.